Zadie Smith gave a reading at the lovely Butler University campus, about an hour south of your humble bloggers. Aside from looking just like she does in her pictures, she gave what just might be the best fiction reading I have ever been to (excepting, possibly, a reading by Sharon Solwitz of a manic, second-person piece in which she literally levitated off the ground and spun like a top). 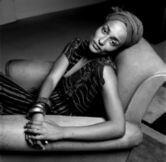 There are two things that made Zadie Smith’s reading perfect for me, and I thought I’d share them with you. #2) She did voices. When asked about her ability to give a fairly accurate imitation of American accents, Zadie blamed television and said the average British child could give you four different kinds of American accents. Regardless, she chose a dialogue-heavy section and did all the voices, I think about four excellently differentiated characters: whiny daughter, tired mother, surly teenage son, unfaithful husband. This giave her reading the feeling of a show, and trumps any amount of length. I would have showed up for ten minutes of that. All of this is to say that I appreciate when a reading has some semblance of spectacle, and is not just an opportunity to lay eyes on the author while they recite the exact same words I’ve already read. It may be unfair of me to expect a show. I’m not asking for a song and a dance, but most fiction is not written with the idea of public performance in mind, and so a straight reading seems kind of unentertaining most of the time. Zadie Smith, on the other hand, made the section she read come alive.